No warning is needed on this post, as it will not be overly technical. That’s with 5 render nodes on, two of them unplugged, and a master not pictured. I ran a test over the last week. I used Mandelbulber and made a 10,000 frame animation to see how long it would take. I decided to go for full-on 4K resolution, with EXR files and as high a color gamut as I could stand. My estimates were that I might need a couple weeks running 24/7, but as this setup should run that long without an issue, I was looking forward to it. A week later everything was good, running on 24 cores – 8 on the master machine and 4 on each of the nodes. I added another node, which is all I dared add to the electricity in that office. Now 28 cores were blazing away! Then I forgot and turned on the office microwave. The power blew out immediately. So I went downstairs to tell the building to trip the breaker. Of course no one can just trip a breaker, they have to go into your office, snoop around, and then send you scolding email about what a bad boy you are running so many computers. Fire hazards, etc. 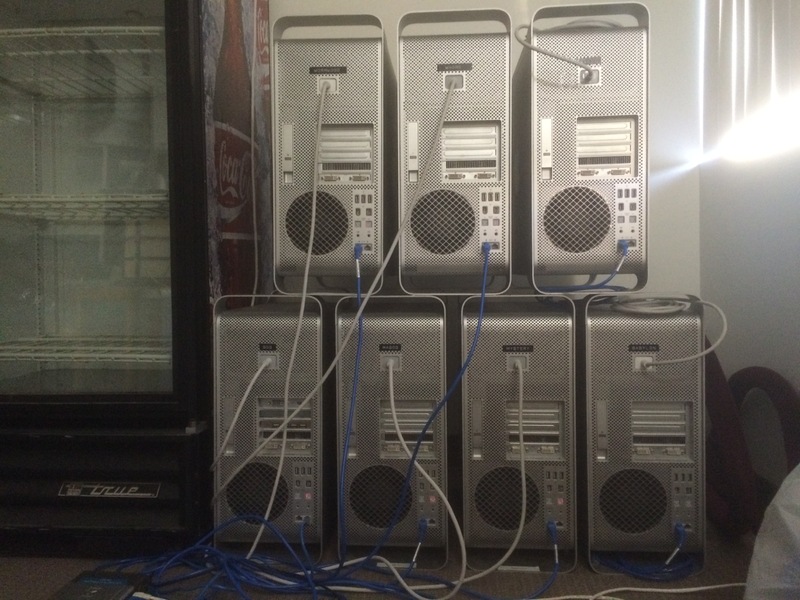 So they made me take all the computers out and dismantle the render farm. Fake Vangelis music courtesy of Mr. Suggs Shiny Beetle Hat.